This May 20, 2016 was an historic day for the animals and the activism for their rights worldwide. THE ZOO OF PAYSANDÚ, IN THE CAPITAL OF PAYSANDÚ DEPARTMENT IN WESTERN URUGUAY, WAS CLOSED DOWN FOR GOOD. 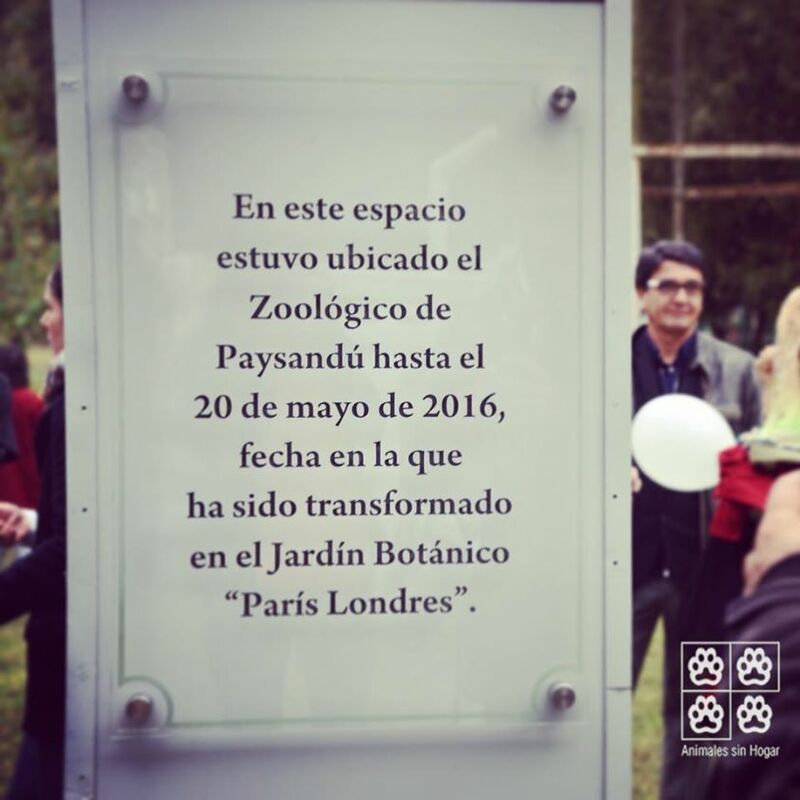 The Zoo of Paysandú was located in this site until May 20, 2016, date in that it has been transformed into the Botanical Garden “Paris London”. 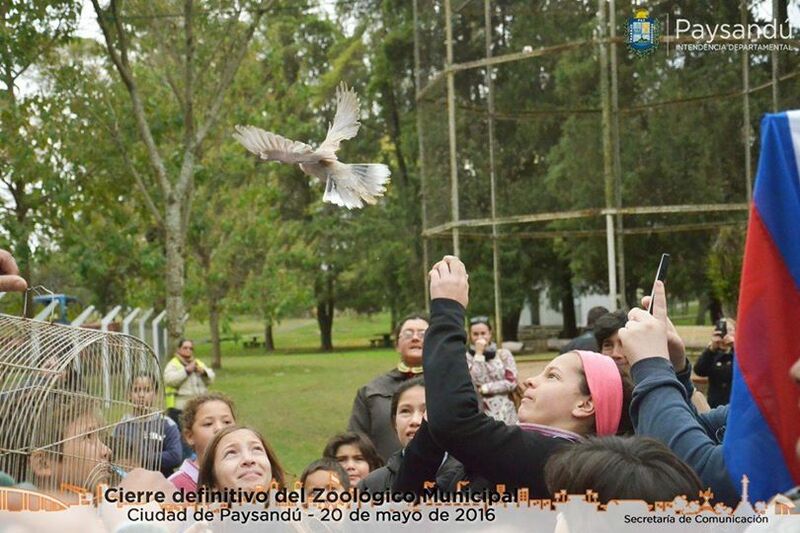 Uruguayan children from public schools release doves who were also prisoners of the late zoo. THANK YOU VERY MUCH TO ALL THE ANIMAL RIGHTS ACTIVISM. I would like to add that man’s inhumanity to the other creatures with whom we share this world likewise makes thousands mourn. Today I was shocked and greatly saddened by the following notification in my e-mail box which I have included below along with a petition which I hope as many of you as possible will sign and share. “An unknown man brutally kicked to death a little penguin on the St. Kilda Pier in Melbourne, Australia. Two weeks later another two penguins were stomped and kicked by a group of men. The colony of about 1,000 small blue fairy penguins living at the St. Kilda Pier are a beloved attraction for Melbourne tourists and locals alike. They have become so accustomed to the crowds of people strolling along the pier, picnicking, and fishing, that they have grown to trust humans. Sadly, this makes the penguins an even easier target for ruthless thugs. Michael was so angry when he found out that people were jumping the fence and purposefully hurting these poor, defenseless penguins that he knew he had to take action. Will you sign his Care2 petition demanding that city officials do more to protect the penguins from these horrific attacks? On the night of the most recent attack, a park volunteer saw a group of young men climbing on the rocks near the penguins and harassing them. The volunteer yelled at them to stop, but he wasn’t able to do much else. Needless to say, the group of men ignored him. 20 minutes later, a tourist found the volunteer and told him that two penguins were bleeding. When he arrived on the scene, he discovered to his horror that one penguin had a deep gash under its right eye and that its mate also had blood on it. Unfortunately, the volunteer didn’t have authority to move the birds for medical attention that night. He came back the next morning with help, but he couldn’t find the injured penguins. 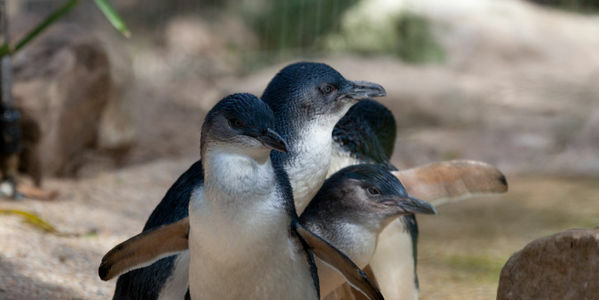 There is still hope that these latest attack victims have survived, but the same cannot be said for the penguin kicked to death two weeks earlier.On that night, German tourists reported one man inside the penguins’ nesting area repeatedly kicking a little penguin while a large group of men cheered him on. City officials cannot just stand by and do nothing while these horrifying acts of violence against defenseless animals continue on St. Kilda’s Pier. The area needs to be patrolled regularly by park officials, and the current fencing should be reinforced so that it keeps people out of the penguins’ nesting area. This really shocked me, the sickening brutality of harming a helpless and defenceless creature is cruelty horrifying and it turned my stomach and made me feel like crying . How can people be so cruel, what the hell is wrong with them????? What kind of person does such a thing to a defenceless animal. In addition to the unimaginable suffering of these tiny helpless penguins it is disturbing in the extreme that such vile ruthless and frankly wicked people walk among us. Yes I know there are many horrors perpetrated in the world towards both human and non human animals and many may consider that the death and injury of these penguins is insignificant. However an animal’s life is important to that animal as our lives are to us, no creature wishes to be harmed in such a way and suffering , pain and death is the same for an animal as it is for a human being. Helping to save the life of even one animal either human or non human reduces the misery and suffering in the world. The famous quotation “Man’s inhumanity to man makes countless thousands mourn!” also applies to man’s inhumanity towards his fellow creatures for the sake of perverted pleasure.Consider that no other animal behaves towards other animals in quite the same way as this cruel element of human behaviour in some people. No animal other than man kills or maims for pleasure. I do not think that this is in the least extreme, an animal’s life is as important to the animal as our lives are to us. No one should have the right to wantonly kill any animal, to kick a helpless creature to death and get away with so doing, receiving a fine or a couple of months in prison is no deterrent at all. Two defenseless ladies from AnimaNaturalis were attacked by cowardly CORREBOUS supporters in TERRES DE L’EBRE, in CATALONIA, SPAIN. CORREBOUS are cruelty to animals celebrations similar to RUNNING OF THE BULLS (in Spanish, ENCIERRO) that involves running in front of a small group of about six cattle of the “toro bravo” breed that have been let loose in the streets of a town, but differ in that the animals are not directed to any bullring. AnimaNaturalis is an international animal rights organization whose mission is to establish, promote and protect the rights of life, liberty, and not to be tortured or being considered property of all animals in Spain and Latin America. Please show your support to animal rights activists of AnimaNaturalis.